I don’t usually keep track of how many different kinds of flora and fauna I eat over the course of a day, but I’m pretty sure I achieved my most biodiverse meal ever at the Village Voice’s 10th anniversary Choice Eats tasting event. This year, the Voice curated more than 50 restaurants and eateries from throughout the five boroughs to strut their most fabulous, fascinating fare for a hard-partying crowd of eaters and drinkers. In the span of two hours, I ate jellyfish, elk, lamb, watercress, ramps, crickets and much more. Here are some of my favorite dishes and where to find them. Upon entering the festival, I was seduced almost immediately by a table of exquisitely plated tacos. Employing the ‘eat first, ask questions later’ method of tasting, I took a large bite of one. I was nearly knocked back by the intensity of flavor—spicy and smoky and piquant all at once. The meat was firm and flavorful in a way I couldn’t place. “What’s in this?” I asked the woman behind the table. 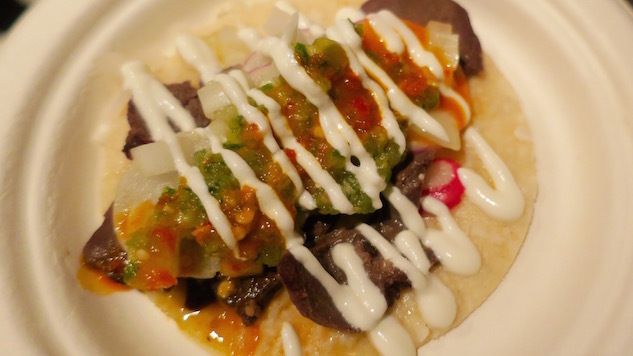 “This is our smoked elk heart taco with ramp salsa and peri peri sauce,” she said. Elk. Heart. I’d never had elk before, let alone the very heart of the beast. It turns out I’m a fan. Crickets may be the future of protein. They are also, I believe, the future (and past and present) of deliciousness. Atop Chavela’s tiny tostadas, they provide a pleasant, crunchy snap. Horchata’s take on elote doesn’t try to reinvent the wheel. But with incredibly fresh, sweet corn and no shortage of salty cheese, they serve up an superb version of a classic. Nom Wah’s jellyfish salad taught me that these soft-bodied drifters are as luminous in your mouth as they are in the dark open ocean. Firm on the tooth, the shreds of jellyfish were not slimy as I feared. With crunchy sesame seeds and peanuts on top and spicy watercress beneath, the dish is a collage of varied yet complementary textures. I didn’t know that I wanted pickles with my mac n’ cheese until I tried the curious reuben mac concoction from Flattopps, a burger and cocktail joint that opened last summer in Astoria. The mild swiss and gruyere mac n’ cheese base perfectly offsets the strong flavors in the pastrami, sauerkraut, and cornichon toppings. Cafe Rue Dix’s empanada-esque pockets of beef and vegetables are delicious in their own right, but it’s the hot sauce that really makes them shine. Just a small dab brings that lovely, slow-burning heat that stays in your mouth through the last crispy bite. With chewy rice cakes in a rich, comforting lamb stew seasoned with gochujang, this dish from Chefs Club seems like the perfect cure for a nasty cold. Or a hangover. Or a broken heart. As far as I can tell, adding tahini to a dessert item can only ever be a good idea. Underwest’s halva donut is one such flash of brilliance. Specializing in glazed cake donuts, this enterprising shop dreams up high-class flavor combinations from a repurposed car wash under the West Side Highway. These sticky, sumptuous stacks of brownie, marshmallow and graham cracker are a blast of summertime nostalgia. In addition to making A+ goodies, Sweet Generation runs an internship program that teaches baking and entrepreneurship skills to at-risk teens in the community.